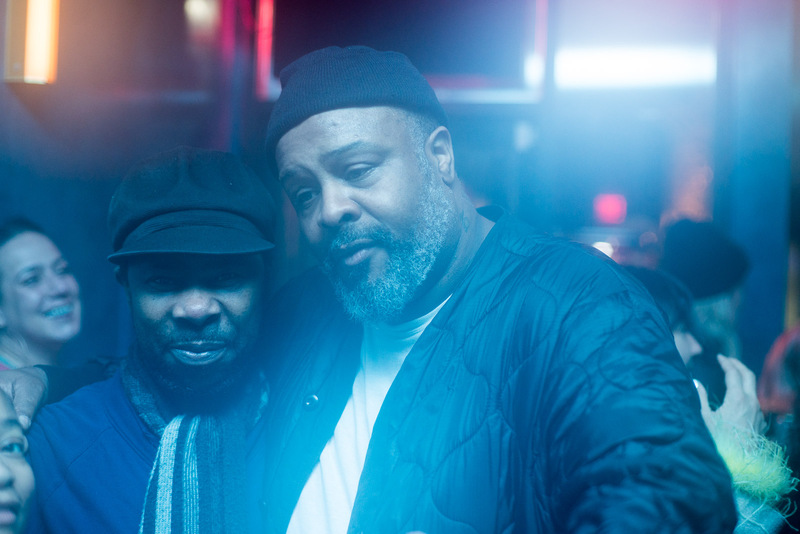 After decades of pouring drinks and managing bars in the city, Kareem Bunton, a gentle giant of New York nightlife, has opened his own place, nestled in the crotch of the J and M lines just east of Myrtle Avenue station. It’s called Bunton’s World Famous. The “famous” part of the name is somewhat aspirational for now; it doesn’t have a Yelp listing yet. 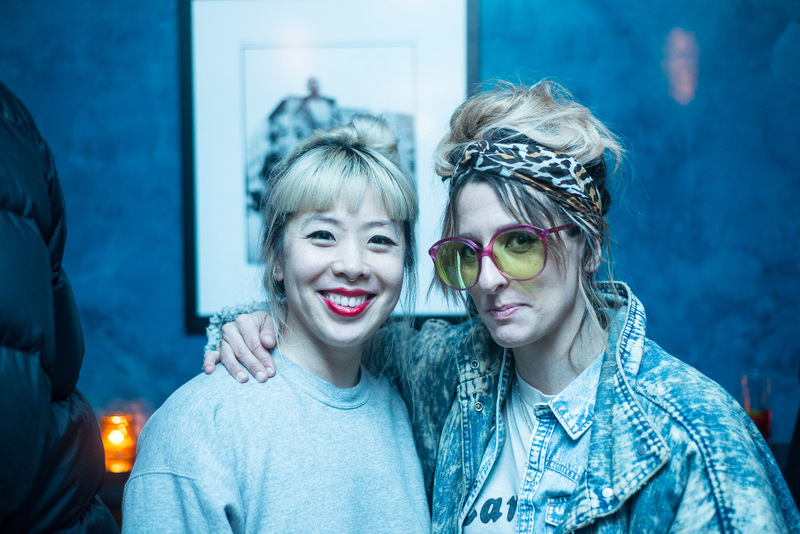 On the other hand, it is getting shout-outs from Cat Power on Instagram (a highly regarded social media platform). 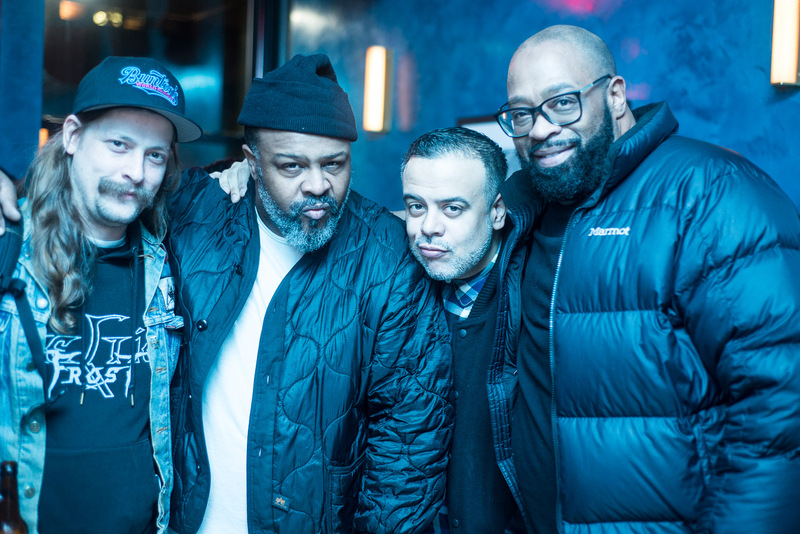 Kareem Bunton (second from left) with guests. 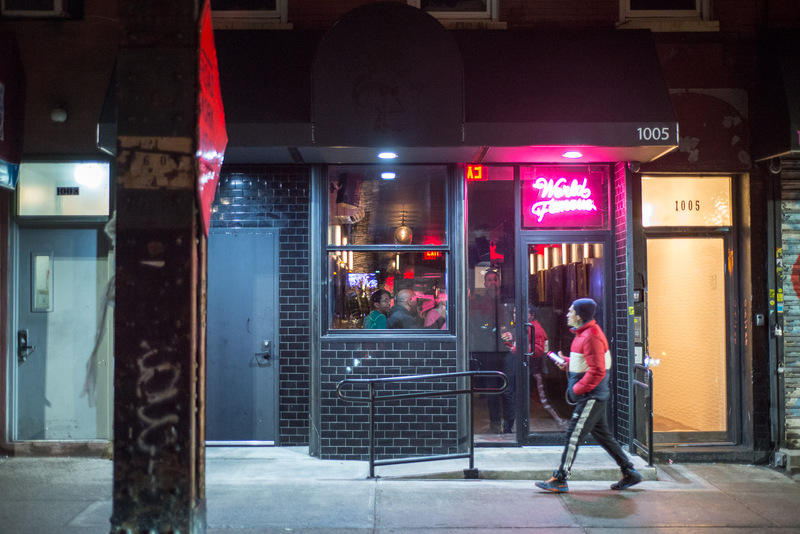 Only time will tell if Bunton’s project will achieve global hegemony, but with its unique pedigree, it’s already a win for Williamsburg’s and Bushwick’s boozing masses. 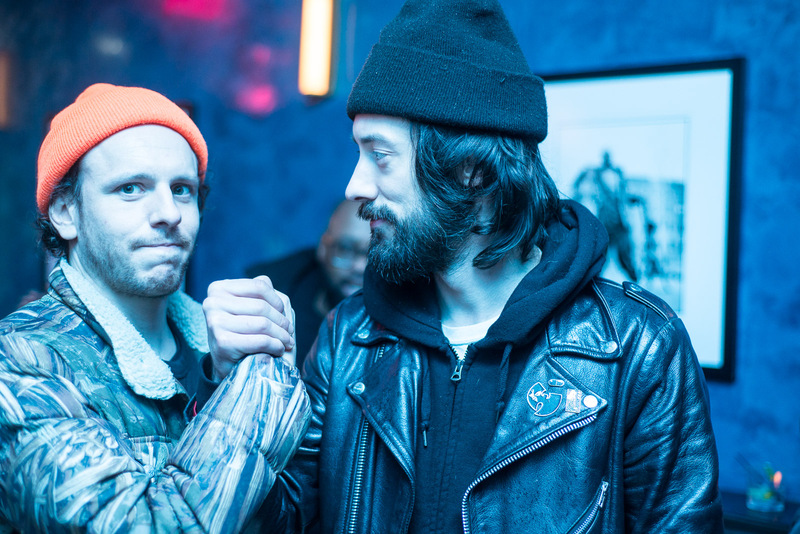 At Bunton’s opening night last Thursday, the proprietor reflected on his bar’s place in the pageant of New York nightlife. 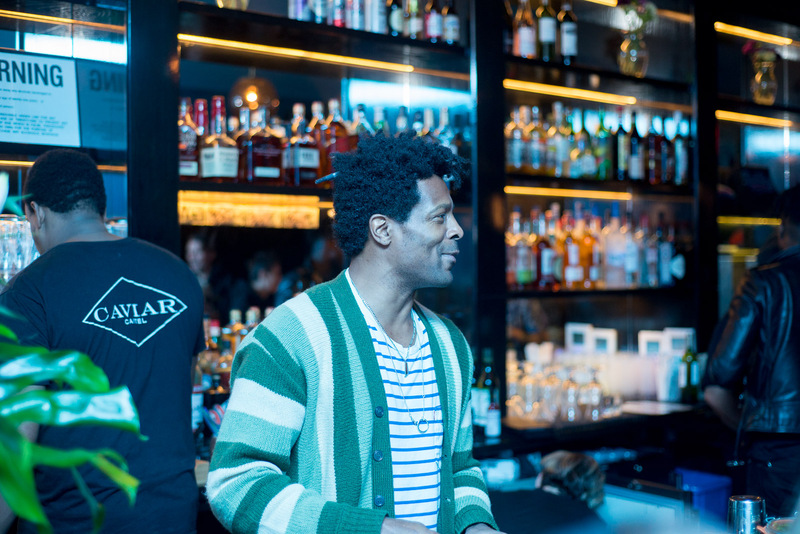 He explained his mission is to tap into an earlier, less balkanized chapter of city’s nightlife. 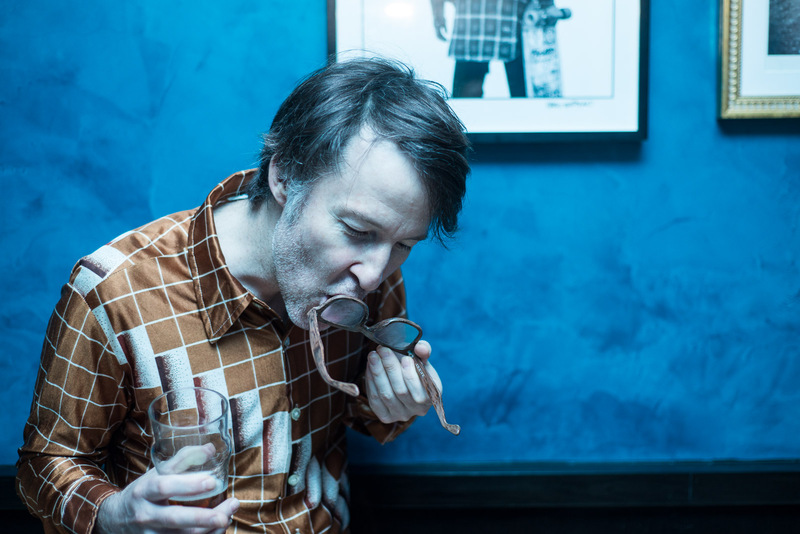 Cynical appeals to nostalgia and authenticity are mainstays for PowerPoint slobs marketing to New York’s nocturnes, of course, but what sets World Famous apart are Bunton’s polymath CV and decades of earning good will in the nightlife and music communities. Bunton moved to New York in 1995 from Iowa City, where he studied English and creative writing on a scholarship. In New York he was in a band with his brother, Jaleel, who later drummed for TV On The Radio. He dabbled in acting, most notably in the pilot for Vinyl, where he played Bo Diddley. Bunton also did motion capture work for Grand Theft Auto: San Andreas. To pay the bills, Bunton has bar-tended or managed at downtown institutions like Max Fish, Pianos, and Von, where he had his longest run. Von’s assets included great genre-agnostic playlists and a clientele that was diverse, stylish, and approachable. Sometimes this was the case even on Fridays and Saturdays, nights when the city does not send its best people to bars. Bunton was not solely responsible for the sanctuary Von offered from the khaki apocalypse, but he had a hand in it. He inspired a devoted following and emerged as a bridge between disparate, otherwise unlinked camps. 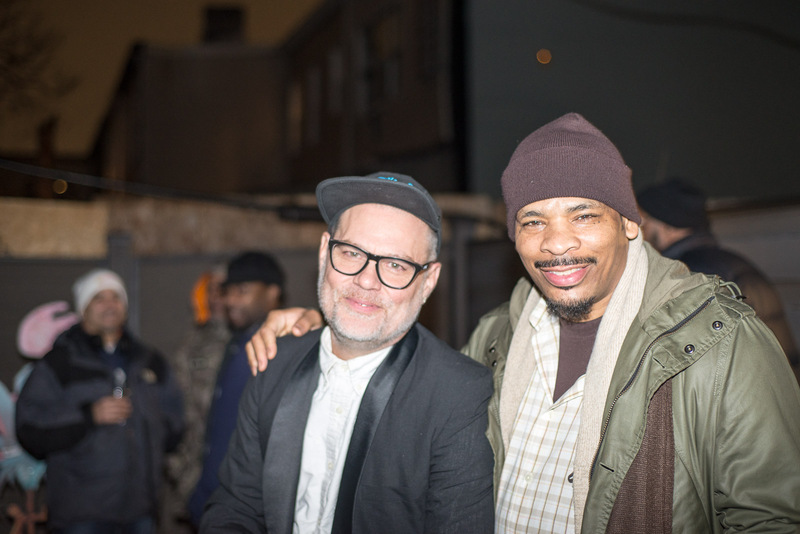 It’s that history and DNA that he has brought to Bushwick. Bunton’s World Famous is not just another tastefully designed bar with tungsten lights: it’s a cone of galactic harmony. “What Kareem has done is bend time,” proclaimed Gary Snyder, an ethnographer and sociology professor at Baruch College. Snyder wore a crisp white dress shirt under a black blazer, thick-rimmed glasses, a baseball cap, and a diamond earring. He has published books and articles about hip-hop artists, street graffiti, and other urban subcultures. He goes back a long way with Bunton. He’s patched into the mainframe. Gary Snyder and Bunton’s cousin, Rebel, cavort at the opening. Bunton’s cousin, Rebel, was also on hand at the Thursday night opening. 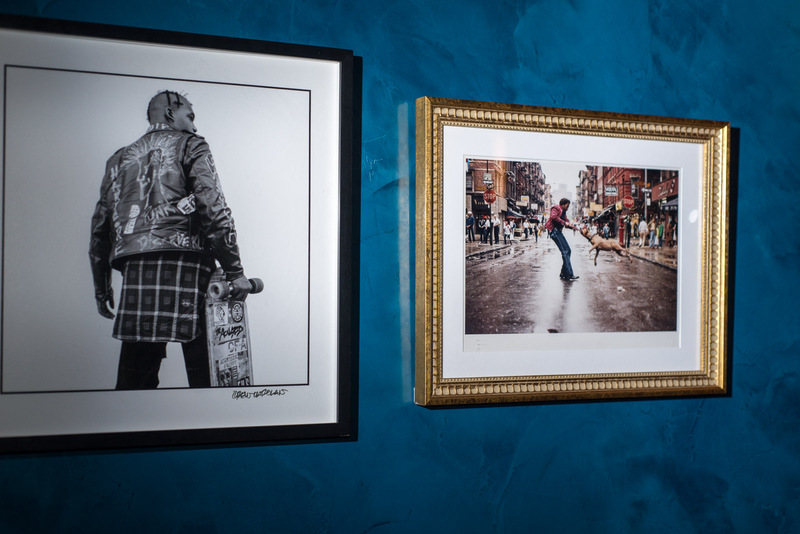 Kareem Bunton and Dinco D.
The bar’s deep-blue walls are adorned with a portrait of DMX next to shots of skateboarders and The Ramones. 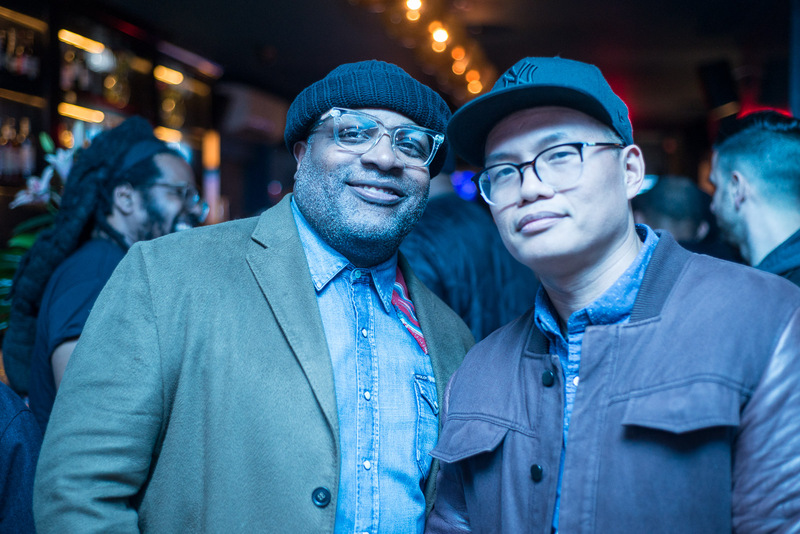 Bunton’s World Famous isn’t the only melting pot in the borough, but spots that pull that off are rare, as are bars in North Brooklyn owned by black proprietors. Bunton’s is a welcome reminder that the city’s diversity is its strength. Stephen Kosloff is a freelance writer and photographer. He is working on a novel and reviews books on the sly at groceryleadership.space.